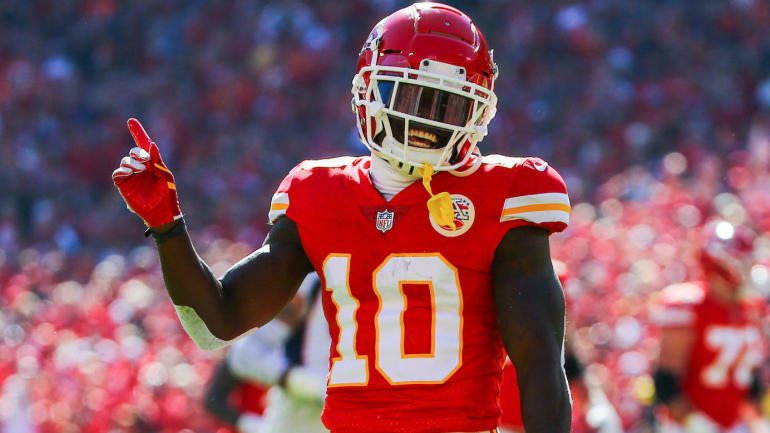 With Tyreek Hill currently under investigation for an alleged incident of child abuse, it was unclear if he was going to be in attendance for the Chiefs‘ first day of offseason workouts, but that question was finally answered on Monday when the receiver joined the rest of his teammates in Kansas City. Although Hill didn’t meet with the media, Chiefs coach Andy Reid did, and one of the first things he brought up was Hill’s status with the team. Reid also made it pretty clear that he only has one responsibility when it comes to Hill. Hill has been under investigation since early March over two separate cases where police were called to his residence to look into possible allegations of battery and child abuse or neglect involving the Chiefs wide receiver. Although police confirmed on March 15 that an investigation was taking place, authorities haven’t really offered any updates since then. As for Reid, the only other time he’s mentioned the investigation came at the NFL annual league meeting last month. During an interview in late March, Reid made it clear that the team won’t be making a decision about Hill’s future until the police investigation is complete. The allegations against Hill came just three months after the Chiefs released Kareem Hunt over a video that showed him shoving a woman. “If we’re going to make a move like [cutting Hunt], it’s pretty well thought out, and so we try to gather the information and then go from there,” Reid said. The Chiefs aren’t the only ones waiting to see how the investigation plays out; so is the NFL, and that’s because a punishment from the league could also come into play in this situation. According to NFL.com, the league is going to wait for the authorities to complete their investigation before they decide whether or not to levy a punishment against Hill. On Hill’s end, the only public comment he’s made since the investigation started came in a workout video that he posted to YouTube on April 2. Although Hill did mention his family, he didn’t specifically mention any details of the case. “I want better for my family and I will get better for my family, more for my family, too,” Hill said.